Also indicating a high level of fear is the CNN Money Fear & Greed Index. This index is in the 'extreme fear' zone as seen below. 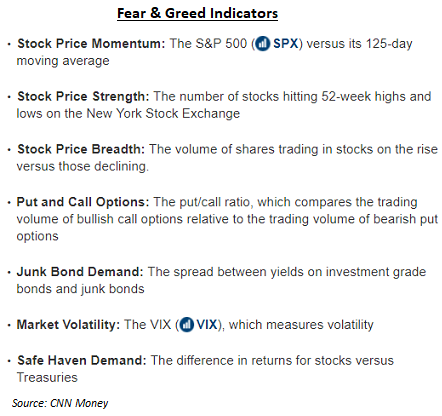 The fear and greed index is comprised of the seven indicators listed below. Below is an updated table of market and sentiment data that I originally prepared in September of 2017. At the bottom of the table is sentiment data and much of it is strongly bearish, which, from a contrarian standpoint, would be bullish for stocks. Also notable is the fact the market valuation or P/E has become more attractive even with the S&P 500 Index up 8.6% since June of 2017. 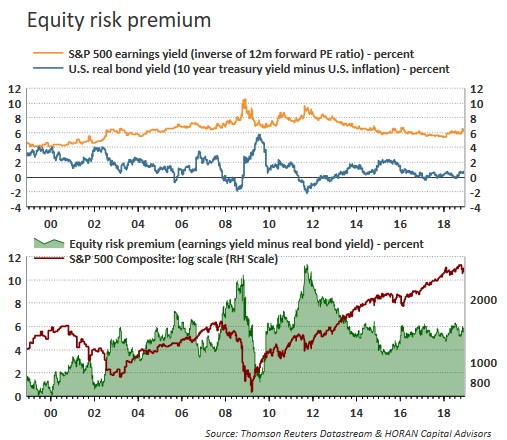 Additionally, the equity risk premium has increased to 5.83%. The ERP is the expected return on stocks in excess of the risk free rate, or real 10-year U.S. Treasury yield. 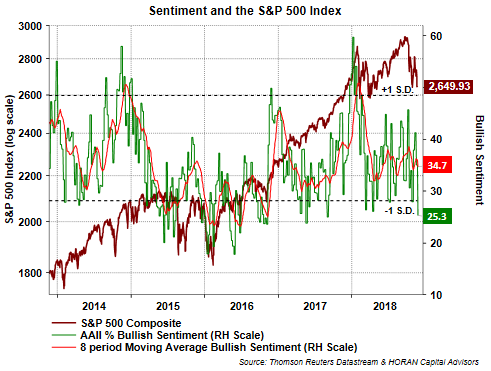 In summary, sentiment continues to trend more bearish and is at levels that historically have signaled equity market bottoms. From a technical perspective though the price action of the market is undeniably negative. For example, in the S&P 500 Index, 41% of the stocks are down over 20% from their most recent 52-week high and another 31% are down between 10-20% from their 52-week high. Overall from a price action perspective then, for the S&P 500 Index, more than 70% of stocks are down more than 10% from their 52-week high. This seems like a high level of downside volatility. However, as noted by Dave Wilson of Bloomberg, "The gap between the S&P 500 Index’s Sept. 20 high and Feb. 8 low is 13.6 percent, according to data compiled by Bloomberg. 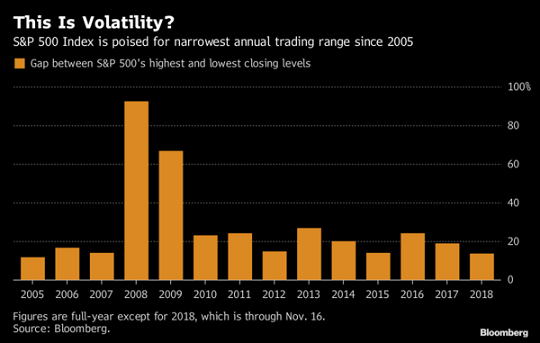 There hasn’t been a narrower range for a full year since 2005, when the spread was 11.9 percent." Just seeing sentiment at bearish extremes, along with favorable business and economic data, may be the necessary recipe for an equity market rebound.